Description: Restrictions apply for some areas in the US, please read this entire ad carefully before offering to buy. This listing is for ONE magazine. For a person, law enforcement or civilian alike, to entrust his or her life to an extra magazine puts a strong responsibility on us. For as long as we have been in business, the best magazines are factory magazines for semi-auto firearms. We only trust One name in aftermarket magazines: Mec-Gar. They free-fall like they're supposed to; they lock the breech open on the last shot like they're supposed to; we've never had One stick a spring or follower. They are, in short, vastly less likely to mis-perform than any other aftermarket magazines. Mec Gar manufactures the factory magazines for many brands, including Browning, Beretta, Rock Island, and Kel-Tec. That is the reason, for example, that the cheap little Kel-Tecs are so reliable. Here are representatives of the Mec Gar 17 round anti-friction Teflon blued steel magazine for the tried and true CZ-75 and CZ-85 pistols made in Czechoslovakia. They will also fit, we are quite sure, the EAA Italian Made Clones and their ancestors the TA-90 Excams. Also, they will fit the Israeli Baby Eagles marketed by Magnum Research. 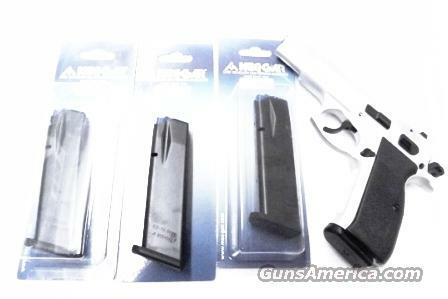 Mec Gar magazines, write the factory technicians, are constructed from certified carbon steel and feature a heat treated housing and a hi-impact polymer or certified carbon steel follower and floorplate. Own 1 for only	$ 29.00. Not for sale to civilians in jurisdictions where 17 round magazines are restricted to law enforcement, includes Aurora IL, Colorado, Connecticut, Cook County / Chicago IL, California, District of Colombia, Hawaii, Maryland, Massachusetts, New Jersey, New York, and South Bend IN. Grips, Magazines, Slings, Holsters, Scopes, Mounts, Parts , buy any 3 items and get Free Shipping! Guns and ammo excluded. Lower 48 only. Live checkout orders that qualify will have the shipping fee removed before the order is charged. Single items non gun non ammo, flat $10. $20 Flat Fee any shipment to Alaska, Hawaii, or Puerto Rico [PR FFL on Gun Parts]. Magazines, small light non-gun items ride free with ammo or gun orders. Checks OK, 7 day hold. GA Pay, MC, Visa, Discover phone- or fax-in 7 3 1 9 8 9 4 7 2 3 orders, USPS Money Order items shipped ASAP please put your full information, item number, and what the item is on any messages. Phone hours 8:00 – 5:00 CST Mon – Fri. Robertson Trading Post 117 Front Street PO Box 365 Henderson, Tennessee 38340. We buy, sell, and trade. Always have, since 1952.